The 150th anniversary of Sibelius' birth is celebrated by the Philharmonia and Vladimir Ashkenazy with three concerts this spring at London's Royal Festival Hall. Ashkenazy is of course a foremost Sibelius conductor (he recorded the complete Symphonies cycle and the major orchestral works with both the Philharmonia and more recently the Royal Stockholm Philharmonic) and while not aiming for completeness these concerts offer a fine anthology of well and lesser known works of the Finnish composer. This was the second concert in the series, and one that somewhat bizarrely added Rachmaninoff's Third Piano Concerto headlining Daniil Trifonov to the Sibelius bill. The Royal Festival Hall was packed for the occasion, yet clearly not because of Sibelius, or indeed Ashkenazy and the Philharmonia. Ashkenazy opened with the intriguing but rarely heard tone poem Nightride and Sunrise. Skillfully negotiating the changes in climate, keeping the piece well together, he coaxed a vividly evocative reading. The luminous string playing in the opening section was pure joy. His account of the Sibelius Fifth which closed the concert was no less affecting. Aided by a Philharmonia in superb doing, with the woodwinds conjuring a seemingly inexhaustible spectrum of color, Ashkenazy's Sibelius struck a convincing balance between lyricism and ruggedness. The transitions throughout the symphony were handled with a sure hand, although Ashkenazy started in a rather relaxed way. As by magic however a climate full of tension was installed – the soft passage with the semiquaver strings figures and the eerie bassoon of Robin O'Neill was absolutely time suspending. The long run towards the end gained tremendous momentum. The quality of the orchestra, assuring textural clarity and detail, made the Andante mosso, quasi allegretto another standout. The final movement was solemn, grandly exhilarating without ever becoming demonstrative. The brass (horns and trombones) created a majestic flow in the famous swan theme, while the strings prepared the way to it in a thrilling manner. All in all, this is magnificent Sibelius, successfully continuing the Philharmonia's special relationship with this composer that started back in the Walter Legge/Herbert von Karajan days. 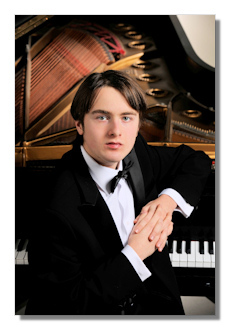 Russian pianist Daniil Trifonov is quite an astonishing performer. He's 24, a multiple competition laureate and has already been labeled the new Horowitz and other ungrateful visionary titles of precocious greatness. As seen some years ago in Baden-Baden, in concert he's something to behold. His boyishly innocent appearance transforms into a demonic trance once behind the piano. Images of the great 19th century heartthrob virtuosos like Paganini and Liszt come to mind, just as well as these cartoonish battles to pound the instrument into submission. Sweating profusely, inelegantly humpbacked with his face virtually on the keys, it's all very amusing and part of the show. But how was the playing? Needless to say, Trifonov has unlimited abilities and if only he can find a way to channel his fearless impetuosity and unbridled imagination into something constructive, a place among the great might be secure. As for now, however, his Rachmaninoff Third was very much work in progress. Extreme, exaggerated, brimming with ideas, far too many for his own good actually, Trifonov seems to be locked in a cocoon during his performance, high on his come-what-may-search for originality which all too often throws musical judgment out of the window. Tempos and dynamics were pulled about, the bigger picture was sacrificed to uneven snapshots, some genuinely brilliant, others merely erratic. Softer passages, often played almost inaudibly soft (as in the slow movement), had a hesitant feel, if they didn't stall, and starkly contrasted with the jaw-droppingly fast runs. It was a miracle Ashkenazy was able to stay with him at all, although in some instances he didn't quite make it. At best, you could call this Rachmaninoff Third a surprise discovery by a supremely talented artist reinventing an old warhorse, but at the other end also looms an aggravatingly mannered circus act. Naturally, Trifonov chose the original long first movement cadenza, yet frankly that sounded and looked like an ordeal. He also has the habit of stumbling in a buildup too loud too soon, engaging in what seems a titanic struggle with his Fazioli piano and accompanied by theatrical panting. On several occasions he reached the limit of volume that the instrument can handle, and that was often way too soon. When Ashkenazy beautifully opened the Intermezzo: Adagio in an already slower than usual tempo, you could bet Trifonov was going to take over even slower, interrupting the set climate. The climaxes in that movement sounded overwrought and missed their impact. A laborious transition by Ashkenazy segued into a superfast Finale delivered with a furious energy, outsized contrasts, a piano that frequently brought everything to a standstill, and final pages that dragged beyond recognition – but then again, following the composer's markings never really seemed to be on Trifonov's agenda. A delirious public received it all with a thundering ovation. Time will tell. And speaking about time, at the end of the concert, maestro Ashkenazy addressed the audience, announcing that principal timpanist Andrew Smith is retiring. For no less than 42 years Andy "Thumper" Smith has been a crucial lynchpin of the Philharmonia sound and an unforgettable presence. And as the Sibelius Fifth readily reminded us, they will have a hard time replacing him.